Donald Trump renewed his Twitter assault on OPEC, pushing the case for lower oil prices a week before the cartel meets to set production policy. "Oil prices are too high, OPEC is at it again. Not good!,” the president tweeted on Wednesday morning. It’s the second time he’s used social media to rail against the Organization of Petroleum Exporting Countries. He made similar comments in April. The U.S. is putting pressure on OPEC members to increase production as global benchmark prices flirt with US$80 a barrel, raising pump prices in the months before the U.S. votes in midterm elections that could decide which party controls Congress. A mix of new U.S. sanctions on Iran, chaos in Venezuela and robust global growth has tightened the oil market. The U.S. has lobbied Saudi Arabia and other members, arguing they need to raise output by 1 million barrels a day to keep prices in check, people told Bloomberg News earlier this month. Saudi Arabia has floated several plans to fellow OPEC members as the kingdom seeks consensus before the meeting in Vienna next week. Russia, the leading country outside OPEC that’s part of the current agreement, is also pushing for higher production. But the countries pushing for looser policy face staunch opposition from Iran and Venezuela, both under sanctions from Washington. Although Saudi Arabia has benefited from oil’s rally over the last two years, the government relies on a strong security relationship with the U.S., giving Washington some influence in the debate over OPEC policy. And while purchases have waned as shale production has grown, America is traditionally one of the biggest customers for Saudi oil. Saudi Arabian Crown Prince Mohammed bin Salman and President Vladimir Putin are meeting in Moscow tomorrow to discuss oil policy on the sidelines of the opening match of the FIFA World Cup. The full organization, plus non-members like Russia who agreed to take part in the earlier round of production cuts, are meeting June 22 and 23 in Vienna. Saudi Arabia last month signaled it was ready to boost output in the second half of the year to ease consumer anxiety about higher prices, a policy U-turn for the kingdom that only weeks earlier advocated for production restraint. "I think in the near future there will be time to release supply," Saudi Energy Minister Khalid Al-Falih said at the St. Petersburg International Economic Forum in Russia in late May. The change in Saudi tone came after major oil consuming nations, including the U.S., India and China, complained about rising fuel prices. On April 20, Donald Trump took to Twitter to lambaste the cartel’s push for higher prices. "Looks like OPEC is at it again," he tweeted. "Oil prices are artificially Very High!" 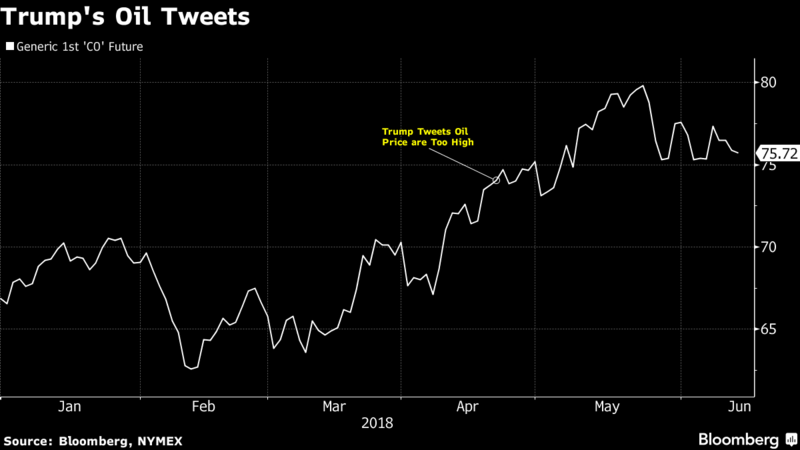 Trump drew lots of tweeted responses, including one from oil hedge fund founder Pierre Andurand, who expects prices will be above US$150 a barrel in less than two years. “At current prices U.S. oil producers are still losing money. Adding to their $500bil of losses since 2007... so if all production growth is unprofitable what makes oil prices high?? Maybe they are actually way too low..."
--With assistance from Michael Roschnotti.